Now, for those of you in globe-filled classrooms, that may seem a silly question. Why would it be relevant in schools? Well, sadly, one reason is there are “flat-earther theories,” by which it seems some people still genuinely believe the earth is flat. In a world in which “fake news” can become a mantra for any uncomfortable idea, the notion that science is a reliable source of information is increasingly under attack. With such logic, why shouldn’t “flat-earther” website be given as much weight as NASA? Why, indeed. That, of course, is the more important reason to join the investigation. Science tests its assumptions and theories, and shifts as new data emerges. 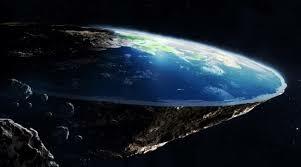 So, how do we know the earth is round? If students are to become questioners and data seekers, they need to see science in action. Better yet, they need to become part of the action. And that is where #MeasureEarth comes in. Brainchild of physicist-blogger Lauren Weiss, #MeasureEarth is a chance to get involved in a global experiment—and all you need is three meter sticks (note to those in the U.S.: not yard sticks), some flat ground, a sunny day, and an internet connection. While the sunny day could be a challenge in Michigan, the rest of the experiment is simple. On October 24 at noon ( your time) follow these directions (taken straight from the #MeasureEarth post). If it’s sunny, go outside to a location with flat ground. Position one measuring stick (henceforth the Shadow-casting stick) vertically. 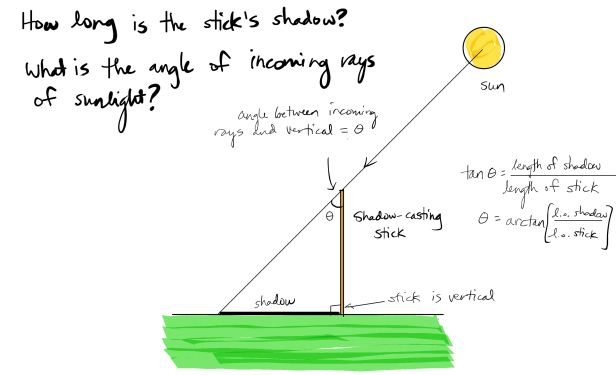 The stick’s entire shadow must fall on the ground for the experiment to work. Optional: use a plumb-bob or other device to keep the stick as close to truly vertical as you can. With the other measuring stick(s), measure the length of the shadow created by the Shadow-casting stick. Optional: Take photos of your setup! Post them to social media and tag your posts with #MeasureEarth. any comments about what happened during your experiment that might have compromised its quality. *You can find your latitude and longitude here https://mynasadata.larc.nasa.gov/latitudelongitude-finder/ or at a number of other websites. Easy, right? Your data will be compiled with data from around the globe. If you have far away friends, forward the information. The more data points, the better! You can follow #MeasureEarth to see the results. I can’t wait to see what happens.